From 5th May, 2017 restaurants and similar retail food outlets in the United States will be required by law to carry calorie counts on all their menus and literature, with additional nutritional information available on request, meaning a huge operational task lies ahead for thousands of food outlets. With Americans eating and drinking about one-third of their calories away from home, the hope is that the provision of this information will help consumers make informed choices for themselves and their families. From sit down restaurants and cafes to drive thru outlets and ice cream providers, the legislation applies to a wide variety of eat in and take-out food establishments, specifically those that are part of a chain with 20 or more locations, doing business under the same name, and offering for sale substantially the same menu items. In addition to presenting calorie counts on menus and menu boards, they must also be declared on signs adjacent to foods on display and next to self-serve foods that are standard menu items. Customers must also be advised on their ‘suggested’ daily calorie intake, i.e. generally 2,000, but this figure may vary. Businesses will also be required by law to post a statement confirming that nutritional information is available on request – covering total calories, calories from fat, total fat, saturated fat, trans fat, cholesterol, sodium, total carbohydrates, fiber, sugars, and protein – meaning additional demands on resources to prepare all the necessary facts and figures before 5th May. And with the mandatory requirement to source all data from official nutrient databases, US F&B businesses have a huge mountain to climb over the next couple of months to become compliant with this new legislation. And it’s not just the information gathering and updating of literature that poses a pressure on organizations, but the added stress of having to substantiate the information to the FDA – including the method and data used to derive the values – certifying that the evidence is complete and that all has been done to present the customer with accurate information. Nutrient values can be determined by using nutrient databases, cookbooks, laboratory analyses and the Nutrition Facts Label on packaged foods but this demands a huge level of time, effort and resource from members of staff, who could be adding value to the business instead. The solution is to embrace an online kitchen management system that does all the hard work for you. 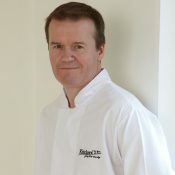 I set up Kitchen CUT with a view to support the industry in addressing common issues such as complying with new legislation that imposes a huge amount of pressure on operational resources that could and should be better spent on increasing business profitability. By providing access to calorie counts and nutritional information at the click of a button, online tools are empowering the industry to tackle the new legislation head on. We have access to almost 12,000 foods on our database, which are sourced from the official USFDA database, among others, these are regularly updated to ensure that our customers are providing their customers with the most relevant and up-to-date information. By easing the administrative burden of the new legislation, members of staff will have more time to concentrate on adding value to the business, focusing on increased profitability through creativity and innovation, customer engagement, training and development and man management. We’ve already seen proof of this in our work helping a number of UK operations become compliant with EU Allergen legislation. Our industry is bursting with innovation in technology for front of house: payment systems, loyalty CRMs, customer ordering and so much more. This new legislation puts a spotlight on how back of house has been largely neglected. So it would seem that there is even potential for companies to turn this new legislative burden into an advantage. By embracing kitchen management systems, businesses will not only swiftly comply with the new legislation, but they will also experience a wide array of additional benefits such as greater levels of consistency, easy control of costs and waste management, and even the tracking of allergens from ingredients right through to dishes and menus. It’s time for back of house to embrace new cutting edge technology and jump into the 21st century alongside the front. List provided by FDA: Meals from sit-down restaurants, Foods purchased at drive-through windows, Take-out food, such as pizza, Foods, such as made-to-order sandwiches, ordered from a menu or menu board at a grocery store or delicatessen, Foods you serve yourself from a salad or hot food bar at a restaurant or grocery store, A muffin at a bakery or coffee shop, Popcorn purchased at a movie theatre or amusement park, A scoop of ice cream, milk shake or sundae from an ice cream store, Hot dogs or frozen drinks prepared on site in a convenience or warehouse store. An internationally renowned chef, John Wood achieved a Michelin star, 4 AA Rosettes and 13th Best restaurant in the World. With more than 35 years as chef, owner, F&B director and consultant, he founded Kitchen CUT to help restaurants more efficiently by developing software to transform the way hospitality businesses operate.